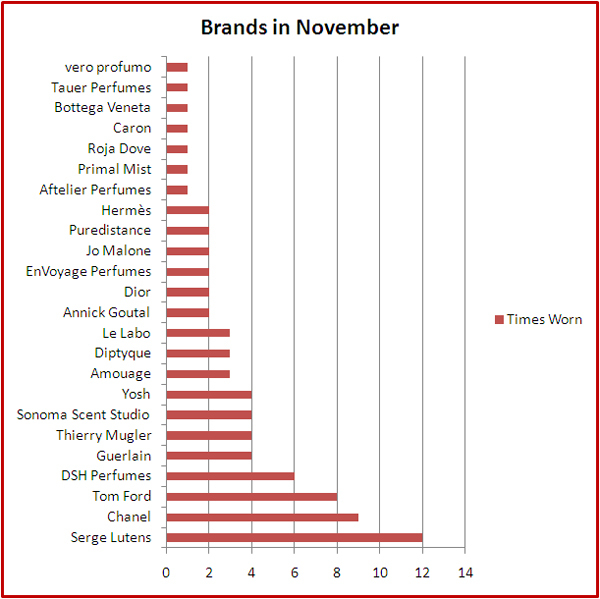 In November, which was wonderful in our area this year, I both wore and tested even less perfumes than the month before. I’m not sure but I think it happened because I wanted to spend more time with my favorite perfumes – wearing them and not just visiting briefly in between tests of more and more new samples. Also I was working on my short-list of perfumes-candidates for joining my collection this holiday season. I’m down to six and working on the final choice(s). My short-list: Une Rose Vermeille by Tauer Perfumes, Cuir de Russie by Chanel, Vert Pour Madame by DSH, Ambre Fetiche by Annick Goutal, Arabian Wood by Tom Ford, Ginger Ciao by Yosh. Also, I just realized that in the last couple of weeks almost every night I was using Sonoma Scent Studio‘s Fig Tree shea butter as my night hand cream and it automatically excludes wearing any other sleep scent (I wrote more about it in my recent post). * Most popular notes (only from perfumes I chose to wear, not those that I tested for the first time): top – (not counting bergamot) rose, galbanum and mandarin; middle – (since rose and jasmine keep that position unchallenged I include the next notes in the list) ylang ylang and iris; base – vanilla, sandalwood, musk and patchouli. * Total number of different notes in all perfumes I wore/tested this month: 176 (-49). Is December (holiday season) different in any way when it comes to building your collection? Do you buy more as a gift to yourself? Do you buy less to slow down at least in the last month of the year? This entry was posted in My Stats and tagged Chanel, Fig Tree, perfume statistics, Serge Lutens, Sonoma Scent Studio, Tom Ford. Bookmark the permalink. I think my testing of new scents may have slowed down this month for the holiday season, mainly because I have had more days where I knew exactly what I wanted to wear. I was interested to see your short list of “wishes” too. Maybe you will get lucky in one of the Tauer advent giveaways! December looks even worse testing-wise: the same as you, almost every day this last week I had that feeling when I know exactly what I want to wear. And many of those perfumes are so tenacious that all I can do is to use some perfume as a sleep scent – if I’m not using Fig Tree cream, of course. It’s so true about the tenacious scents. No. 19 is definitely an all day affair for me, as are Shalimar and anything from SSS. I also find that because *everything* seems to be scented at this time of year (holiday treats are everywhere, people use festive room sprays in shops, etc. ), I either don’t want to wear anything, because it all just becomes too much, or I want to wear things that are “loud” enough to drown out (for me) the other smells. I started thinking already about the perfume for my company holiday party… though I hope food won’t be that bad. I find my collection is very swayed towards autumn/winter scents so I’m wearing my favourite full bottles a lot lately. Mitsouko, Une Rose, Cuir de Russie in particular, but also my Aomassai decant. Apart from that I think I’ve hit a bit of a brick wall where samples are concerned after several years of non-stop testing. Love, love, love your shortlist for the holiday season (though I don’t know the ones by DSH and Yosh). I haven’t tried Cuir de Lancome yet though every time Mals mentions it in her scented diaries I tell myself that I have to find a sample. I will – as soon as I lift my self-imposed maratorium on buying samples. On a bright side – in a couple of days I will be a proud owner of the Cuir de Russie bottle! I will write more about both Vert pour Madame and Ginger Ciao. They are worth their own stories. I’ll vouch for it too — CdL is one of my all time faves. I didn’t forget! I was just waiting for my order to arrive – wanted to make sure it wasn’t too good to be true. The site is FragranceStop.com. I placed my order on 11/30. Today I got the package. It looks and smells authentic. I will be shopping with them more. Free shipping on $15+. I used a coupon Holiday2011 and got 5% off.